Ahh, kettle chips. Back in the day, I used to eat them thoughtlessly while enduring a meaningful sensation of roof-of-the-mouth-tear. The super crunchiness of kettle chips had a feeling and taste that were incomparable to anything else, even RRRuffles’ enervated ridges. The snack food possibilities in the early to late ’80s were somewhat unexciting, especially if you compare them with today, but I’m telling you…kettle chips were IT. Well that was then, this is now. Now I don’t like the roof-of-the-mouth-tear so much as I did when I was a kid. At least I don’t understand a feasible meaning for it. Cap’n Crunch cereals are almost off my eating list too. (if only it wasn’t so tasty right out of the box!) As far as food goes, if it rips the roof of my mouth, it better be darn good! The best even! 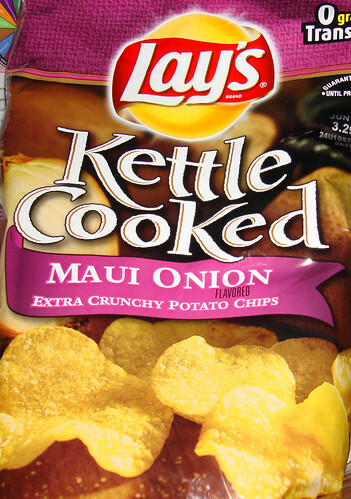 And that is where Lay’s Kettle Cooked Maui Onion Potato Chips come into play. Frito Lay you are truly a great maker of chips that I adore, but I know you are weak. Weak enough to not be a mouth-tearing disaster. I trust your product name as well as trusting a certain gentleness about your products. No offense, but you will never be Poore Brothers, and that is why I bought you. Good call on my part. 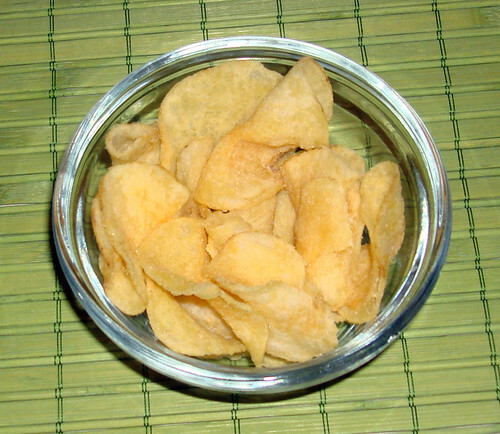 Lay’s Kettle Cooked Maui Onion Potato Chips were not crunchatized as the Cap’n might do, but they were much crunchier than a regular potato chip. The Maui Onion flavor was gentle and satisfying with almost no fingertip residue. I would actually go so far as to say if Funyuns were a potato chip rather than a corn meal-based “onion flavored ring”, this would be the chip. So if you like Funyuns’ flavor, but prefer the texture of a kettle cooked chip, Lay’s Kettle Cooked Maui Onion Potato Chips may be the answer for you. Frito Lay, you can’t fool me, but I will keep your Funyuns secret to myself.